However, the actual experiences of Spain in the crucial years of transition from 1978 to 1983 illustrate how building federalism from below can involve unexpected complications, and may prove to be less of a bottom–up enterprise than initially envisaged. The first point concerns the danger of federal chaos and reactions from conservative forces if the federalisation process should develop in unforeseen ways. In Spain, it had generally been expected that two or three regions with long-standing autonomy demands would take steps to ensure autonomous status, whereas the remainder of the country would retain a more unitary state structure. In fact, however, several candidates for self-rule suddenly materialised out of the blue. Members of the old establishment, particularly within the military, reacted negatively towards what they saw as a decentralisation process running out of control, and even many democratically inclined politicians were critical of the rapid proliferation of autonomy ideas in areas where such demands had no past history. (4) Matters came to a head with a military coup attempt in February 1981; at that point Spanish politicians decided that greater top–down control was needed and they effectively took over the job of completing and sealing the country’s federal map, including the demarcation of the federal regions of central Spain. (5) A compromise on federalism was thus an integral part of the package that facilitated Spain’s transition to democracy – in fact, in the 1990s Spain was able to “reopen” the federalism debate in a less frenzied atmosphere, now with the European Union as a stabilising external factor. MAP 1. Spain’s pre-democracy regional structure (left); the administrative map of modern Spain (right). 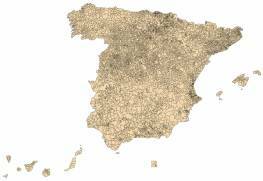 The second important aspect of the Spanish experience has to do with the relatively high influence of regional administrative divisions of the past even in this setting of extreme flux and theoretical openness to change. Thus, ten out of the twelve mainland regions that were defined by bottom–up initiatives from the municipal level before the 1981 compromise on federalism had been readily identifiable as regions in the times of General Franco and earlier. 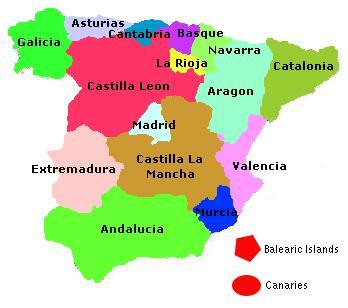 Only two of the regions established prior to 1981, Cantabria and La Rioja (both uni-provincial “secessions” from the larger region of Old Castile), represented radical departures from this general picture. Arguably, one important reason why the instability of the Spanish transition could be contained was the relatively strong and unequivocal historical legacy that pointed towards a particular configuration of territorial entities. These two points offer historical lessons of relevance to Iraq’s current situation. Firstly, federalisation is destined to become an extremely contentious issue in a state that emerges from a centralistic path. Clearly, reactionary attitudes to federalism should not be allowed to block the progress of genuinely popular desire for radical decentralisation. But the Spanish example shows that moderation and compromise in federalism issues can be the key to a successful democratic transition, even if this may mean that no group obtains exactly the state structure it was hoping for at the outset. Secondly, the importance of strong regional historical legacies should not be underestimated. Whereas most of Spain’s federal units can refer to long experiences of administrative separateness, only Kurdistan and possibly the projected small-scale region of the south known as iqlim al-janub (Basra, Maysan and Dhi Qar – the old Ottoman vilayet of Basra) exhibit anything remotely comparable to this in Iraq. (6) (Kurdistan’s special position on this score was recognised through the enshrinement of Kurdish autonomy in the Iraqi constitution – a parallel to the Spanish recognition of long-standing self-rule demands through the “fast track” route to autonomy in article 151 of the 1978 constitution, but in the Iraqi case done in classic top–down style.) 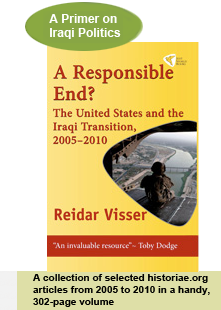 Throughout the rest of Iraq, historically there has been unity and subordination to Baghdad for long periods. (7) Thus, some of today’s schemes, such as the project of a nine-province Region of the Centre and the South (iqlim al-wasat wa-al-janub), do not correspond to any substantial historical precedent. (8) Of course, this in itself is no argument against the legitimacy of these projects – modern, voluntaristic federal entities may be just as successful as “historical” ones. In Spain, creations like Cantabria and La Rioja were ridiculed for their alleged “artificiality”, but one might also turn that logic on its head and argue that creativity may indeed be necessary to break centralist hegemonies of the past. But the point about historical endurance is worth bearing in mind when it comes to dangers of political instability, and it is one which the protagonists of the “modern” regions should heed so as to secure the safest possible transition to federalism for their citizens. This is doubly important because of the extremely low thresholds for initiating and repeating referendum initiatives under the Iraqi system, something which makes the entire process even less predictable than was the case in Spain. These general observations on the limits of existing models of federalism “from below” are relevant to analyses of the new legal framework for implementing federalism in Iraq, adopted on 11 October 2006 – and, in particular, to discussions of possible complications that may arise once that law is put into practice. One remarkable feature of the Iraqi discussion of this legislation project is that very little of what has been said has been based on readings of the actual text adopted. Indeed, for a long time it has been almost impossible for the general public to obtain copies of the considerably modified version of the law that was agreed on after an original draft had been introduced on 26 September. (9) This in itself suggests that the public debate on the subject cannot be considered to have been truly exhaustive. Perhaps most problematic of all is the question of how to proceed in case several incompatible autonomy initiatives are launched and successfully survive the poll pre-selection process. 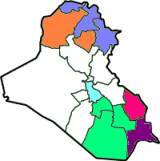 Basra citizens may decide for a referendum on a uni-governorate Basra region. Residents of Maysan may come out in favour of a vote on a slightly larger Region of the South involving Basra and Dhi Qar as well. The people of Dhi Qar, in turn, may want to give a chance to the idea unifying all the Shiite communities northwards to Karbala – except that the inhabitants of Babel may want a referendum on a small-scale Middle Euphrates region, while those of Wasit and Karbala may not be enthusiastic about federalism at all and could fail to produce federal initiatives that would satisfy the minimum legal requirements. Perhaps the people of Diyala and other areas with strong Iraqi nationalist traditions might decide to take a pro-active stance to the challenge of decentralisation, by introducing a surprise nationalist–federalist project: a “Region of Mesopotamia” – iqlim al-rafidayn – stretching all the way from Basra to Mosul, and with the potential to put a stop to what could otherwise become an endless string of autonomy bids. This is all theory and hypotheses, but it is clear that a considerable mess – as shown in Table 1 – can emerge at the “poll” level, even before any referendum is held. At least two very different scenarios can be inferred from this theoretical example. 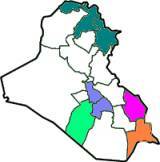 One alternative would be for all the referendums to go ahead on the basis of their original formulas, even as voters in Najaf and Muthanna would know perfectly well that some of the governorates listed in their preferred nine-governorate scheme would be barred from joining their entity – because in those governorates a different and mutually exclusive small-scale regionalist vision had triumphed in the local pre-referendum poll. A possible result might be the further fragmentation of the large-scale federalist project, with majorities in relatively poor Qadisiyya, Muthanna and Dhi Qar voting in favour, but with Najaf voters changing their minds and saving their vote for a uni-governorate federal entity at some future stage. The outcome would be a mix of uni-governorate entities, “rump” regions consisting of remnants of large-scale projects that failed to acquire support in all of their targeted governorates, and a rump Iraq without devolution to the regional level (Map 2, left). MAP 2. Left: Rump Iraq with remnants of partially successful regions; right, rump Iraq with uni-governorate and small-scale regions formed on the basis of pre-referendum elimination polls. An alternative method would be to take more seriously the concerns of the voters: there is little point in staging a referendum for a project if its infeasibility is implicitly acknowledged ahead of the vote, as a result of the rise of incompatible schemes in one or more of the targeted governorates. Accordingly, should a situation arise along the aforementioned lines with mutual incompatibility between the various proposed schemes, it would make sense to ask voters to restate their preferences in light of the new realities, in a second pre-referendum poll. (To be workable, this kind of elimination race would require coordination and indeed synchronisation between governorates.) In such a poll, wealthy and autonomy-minded governorates like Najaf might elect to recast themselves as uni-governorate regionalists, thereby repeating the problem of exclusion on a smaller scale vis-à-vis poorer provinces like neighbouring Babel, Qadisiyya and Muthanna (who might still wish to pursue a second amalgamation bid, this time on a smaller scale, as a Middle Euphrates region). Najaf’s desire to go it alone would then perhaps impact on popular sentiment in the remaining Euphrates governorates during a third pre-referendum poll; Babel and Qadisiyya might conceivably agree on a joint two-governorate project, leaving Muthanna out in the cold. The end result with this kind of procedure would be a combination of small-scale regions, uni-governorate regions, and a rump Iraq of anti-federalists and governorates excluded during the initial poll rounds (map 2, right). As of today, Iraqi lawmakers lean towards the second of the interpretations outlined above. To be valid, an autonomy referendum must correspond exactly to the territorial entity defined in the initiative; regions of “leftovers” are unacceptable and must be built from scratch instead. This means that the primary focus of future instability concerns failed regional initiatives on a larger scale: it is very easy to launch an initiative, but quite difficult to make it victorious in a single referendum. This in turn makes the prospect of repeated initiatives and even pre-referendum polls very real. Additionally, the problem concerning partially successful regions – outlined above with regard to the pre-referendum poll stage – may become equally relevant should a referendum on a successfully launched large-scale initiative fail in the referendum in one or more of the affected governorates. The Spanish constitution explicitly gives recognition to such partial regions (article 153.3), but it remains unclear whether a similar interpretation would be acceptable in Iraq. Such regions could be purely accidental creations which no one had even thought about prior to the referendum, and with the absence of a requirement for territorial contiguity in Iraq, they could in theory assume rather contorted shapes. Fortunately, certain trends among leading Iraqi politicians can go some way towards mitigating these problems. Much emphasis is attached to the 18 months moratorium on federalism as a period for educating public opinion about the federalism question. Importantly, Iraqi politicians have a far more sophisticated approach to the overall question of decentralisation than many Western commentators. Iraqis tend to emphasise the asymmetrical, multi-layer characteristics of the Iraqi constitution, which mean that there is no absolute imperative for systematic federalisation, and many governorates may well choose to retain their current administrative status in the future. Some leading Iraqi politicians contend that a law on the governorates with provisions for wide-ranging local autonomy will make federal regions an exceptional feature of the Iraqi system, perhaps limited to the Kurdish areas and one or two small-scale regions elsewhere. Additionally, with a few exceptions, the majority of pro-federal Iraqi politicians have so far stayed true to the bottom–up principle, by refraining from aggressively marketing any preferred regional vision during what is a critical period of transition. Helpful as such attitudes may be, certain questions pertaining to the legal framework remain. International political history has shown that federalism from below is a particularly challenging venture, and Iraq above all needs a decentralisation system that is watertight and capable of smoothly tackling the unforeseen. In particular, avoidance of a string of dead-end federal initiatives and the concomitant potential for political instability would seem a natural goal. At the same time, it is desirable that the democratic spirit of the bottom–up approach be preserved: the very last thing Iraqis want today is new dictatorships at a federal level. Two remedies could be relevant in this regard. Firstly, the existing law on implementing federalism could be elaborated in areas where it currently leaves question marks. Secondly, the committee charged with revising the Iraqi constitution could undertake a more thorough rethink of the basic framework for the country’s federalisation process. MAP 3. Left, Spain’s fine-grained system of some 8,000 municipalities and the starting point for federalisation in the 1980s; right, Iraq’s provinces which form the suggested and comparatively crude framework for federalisation by way of “popular” initiatives. The relevant population figures are 35 million for Spain in the 1980s and 25 million for today’s Iraq. Finally, it would be wise to think through the feasibility of any kind of further federalisation pending the completion and institutionalisation of the central government structure laid down in the Iraqi constitution. It has been suggested that at one point, during the putsch in February 1981, the persona of King Juan Carlos was the single factor that saved Spain from a relapse into authoritarianism. Under a republican system, this kind of safety valve of traditional authority is not available, and, in the Iraqi case, the scope for conflicting interpretations of the relevant legal codes for the federalisation process is such that the role of the arbiter will exceed what is normally expected from an independent electoral commission. Hence, it seems ill advised to enter this kind of legal grey-zone area without at least a constitutional court that is up and running. (15) The experiences of Spain strongly suggest that candidates for bottom–up federalism will need to prepare for the unexpected and for worst-case scenarios if their ambitious ideas are to prosper. 1. Special thanks to Safa al-Din al-Safi, Iraq’s minister of state for national assembly affairs, for valuable information concerning the newly adopted law on the implentation of federalism, as well as to Lukas Oldenburg, Klaus-Jürgen Nagel and Tom Harrington for helpful comments concerning the autonomy question in Spain. 2. 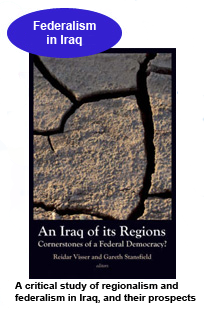 See Reidar Visser, “Building Federal Subunits By Way of Referenda: Special Challenges for Iraq”, 9 June 2006, http://historiae.org/federalism.asp. For an interesting hybrid case of tentative federal re-structuring “from below” (but with robust arm-twisting from above), see the case of contemporary Russia, as discussed by Helge Blakkisrud in “To Merge or Not To Merge: The Debate on Rationalizing the Russian Federal Structure”, paper presented to the ASN Convention, Columbia University, New York, 23–25 March 2006. 4. To some extent, this echoed reactions seen under the Second Republic (1931–1939), see Luis Moreno, The Federalization of Spain (London: Frank Cass, 2001) p. 56. 5. 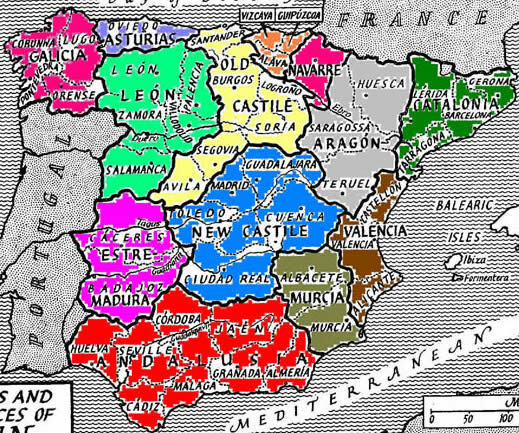 Elite demarcation was instrumental in creating the region of Madrid and determining the new borders of the two Castiles. Effectively, Extremadura was also affected by elite-level decisions, as it had not seen municipality-level initiatives prior to 1981. The early initiatives for regionalisation outside the traditionally autonomist areas (Catalonia, the Basque Country, Galicia and, arguably, Andalusia) are often overlooked; for some interesting examples see Lukas Oldenburg, Recht auf Gleichheit vs Recht auf Differenz: Dezentralisierung und peripherer Nationalismus am Beispiel Kataloniens, thesis submitted to Europa-Universität Viadrina in Frankfurt (Oder) 2005, p. 62, n. 171. 6. 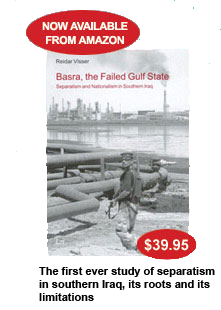 On the history of various regionalist attempts in Iraq south of Baghdad, see Reidar Visser, Basra, the Failed Gulf State: Separatism and Nationalism in Southern Iraq (Berlin: Lit Verlag, 2005). 7. Even though Mosul technically formed a separate entity in certain periods, its politics was on the whole tightly linked to Baghdad; see for instance Stephen Longrigg, Four Centuries of Modern Iraq (Oxford, 1925), pp. 209–210. 8. One might perhaps argue that there are certain parallels, albeit tenuous ones, between today’s project of a grand all-Shiite entity and the ephemeral Hilla-based Mazyadid tribal Shiite emirate of the eleventh and early twelfth centuries. The latter has a rather marginal place in Iraqi historiography and so far has not been evoked by today’s proponents of a single Shiite federal unit. 9. The subsequent discussion is based on the original draft plus the descriptions of new amendments given in al-Ittihad, 12 October 2006 (requirement for consent by all affected governorates in referendum, and with at least 50 per cent participation), and al-Adala, 14 October 2006 (regions not to merge into super-regions). Texts purporting to represent the final version but failing to incorporate these changes continued to circulate in October 2006. 10. According to the draft law, there is a two-month deadline for holding a poll in the case of multiple federal schemes. But if the poll is to be held earlier than this, the question of the final date for challenges will be highly pertinent. 11. Two real and two more hypothetical federal visions are employed here: firstly, the existing projects of Iqlim al-Janub (Basra, Maysan, Dhi Qar) and Iqlim al-Wasat wa-al-Janub (all nine Shiite-majority provinces from Basra through Karbala); secondly, the more theoretical schemes of a Middle Euphrates region, Iqlim al-Furat al-Awsat consisting of Najaf, Babel and Qadisiyya – this actually has some tentative precedents dating back to 2005 – as well as an imaginary all-Iraq region designed as a nationalist response to the decentralisation challenge, Iqlim al-Rafidayn or the old Iraq minus Kurdistan and Baghdad (under the Iraqi constitution the latter is specifically prohibited from joining any region). 12. Another obvious argument in favour of tighter rules is the prospect of outsider interference: in a society dominated by militias it will be relatively easy for political powers outside the governorates to engineer factions large enough to satisfy the current regulations for launching an autonomy initiative. Another alternative would be to re-impose limits “from above”, for instance such as a ceiling on the number of governorates allowed to amalgamate (the 2004 Transitional Administrative Law has a limit of maximum three governorates), or a requirement about territorial contiguity (as in the Spanish precedent) – both of which would serve to cut down the number of potential combinations and thus reduce the scope for chaos and political instability. 13. 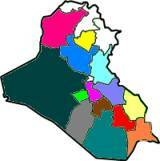 The Iraqi model of local administration, largely inherited from the Ottomans, is asymmetrical in that whereas the entire country is divided into governorates, districts and subdistricts, municipal administrations have been carved out within the subdistricts in urban areas, but without any corresponding administrative structure in the countryside. A US-led venture to create a further layer of local-level politics of more than 1,000 “neighbourhood councils” was launched after 2003 but has reportedly partly disintegrated since 2004. On the other hand, many of the nahiyas and municipalities can be considered among the oldest elements of the state machinery of modern Iraq, with their roots and administrative borders in many cases dating back to the late nineteenth century. 14. These statistics also point to the dual-edged nature of federalism from below. It is the beauty of such a system that local communities are accorded increased control of their destiny: the higher the number of local-level entities whose consent is being sought, the more difficult it will be for outsiders to rig and manipulate the federalisation process. But small localities can also create hiccups, as names from Spain’s political history attest to: Almeria delayed the formation of the Andalusia region through abstentions; Teruel protested against the autonomy process in Aragón; and Segovia voiced resistance against inclusion in the re-constituted Castile and León. 15. Under the Iraqi constitution a special law on the composition of the court must be adopted with a two-thirds majority.